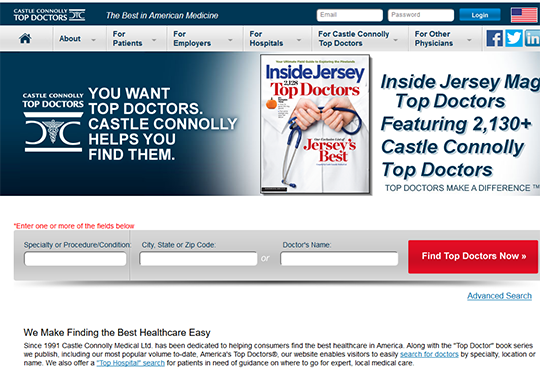 Castle Connolly Top Doctors Website helps consumers to search for doctors by specialty, location or name. They also offer a “Top Hospital” search for patients in need of guidance on where to go for expert, local medical care. Top doctors are identified, both nationally and regionally, based on an extensive nominations process open to ALL licensed physicians in America. The Castle Connolly physician-led research team reviews and screens all nominated physicians before selecting those regarded as the most outstanding healthcare providers to be Top Doctors. Physicians do not and cannot pay to be selected as a Castle Connolly Top Doctor.